I was listening to some lectures on Relativity to celebrate the 100th anniversary of Einstein’s General Theory of Relativity. What struck me, again, was how claims to be entirely rational all contain an element of magical belief. The concept of “time” is not, I think identical to “the elapse of time”. Suppose that “the elapse of time”, along with space-time and all matter and all energy, came into existence only with the singularity called the Big Bang. Then the Big Bang theory and the Genesis Creation myth are similar in that both ultimately rely on the invocation of Magic. Genesis labels the Magic as “God”. The Big Bang theory either assumes that the singularity just Magically came to be, or claims it was inevitable and due to the laws of quantum physics, which just Magically came to be. Both Genesis and the Big Bang theory begin with “In the beginning….”, which inherently contains the assumption of a concept not only of “time”, and the existence of a “before” and an “after” but also the concept of being “timeless”. The state of “before” applied to “the beginning of time”, can only be a timeless state (stasis) or a state where time exists but does not elapse. Magic is to the Big Bang theory what God is to the Genesis Creation myth. Physicists (cosmologists) claim that the Big Bang occurred 13.8 billion years ago (definitely less than 15 billion years ago according to Hawking), but I question that. Physicists are being illogical here. The existence of a singularity on the time axis itself requires that a “speed of time” exist. Since, at the singularity the “speed of time” was – must be – zero, it must have subsequently, in the first apparent moments after the singularity, accelerated to the current rate of elapse of time. So the 13.8 billion years ago is only an apparent, perceived point along the time axis where ℜeal time actually goes back to infinity (and must do so). The Big Bang does not, apparently, mathematically permit of a time older than 13.8 billion years. Magical ℜeal time, of course, goes back to infinitely long ago. All can be resolved merely by accepting that ℜeal time elapsed at zero rate at the Big Bang and then gradually built up to the rate of elapse we are subject to now. There are those (Stephen Hawking) who say that anything before the Big Bang is indeterminate and indeterminable because all the laws of physics, and even the conservation of matter, break down at a singularity. 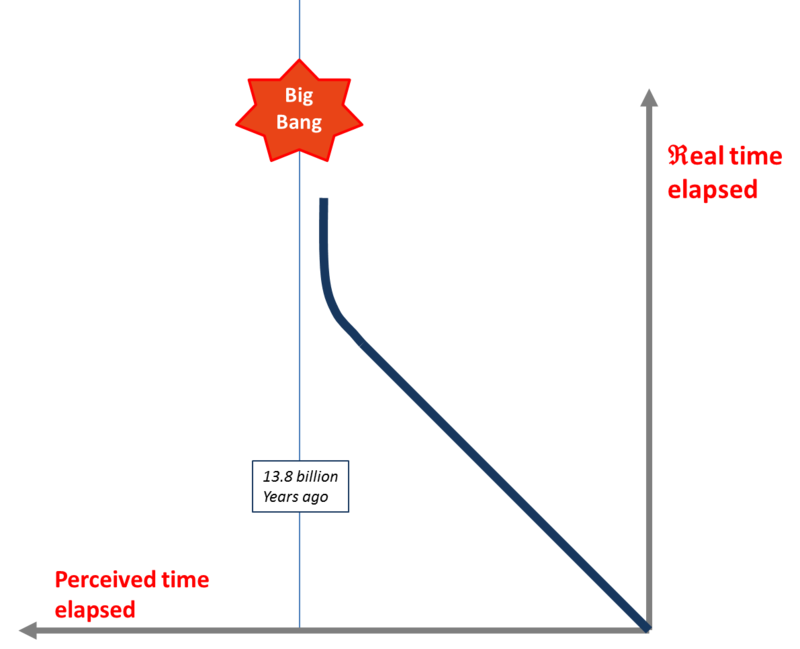 Therefore, Hawking claims, “time” starts with the Big Bang. He claims that whereas the Genesis Creation myth requires the external imposition of a God, the Big Bang theory is just an extrapolation backwards of the “dynamical laws that govern the universe” and is therefore “intrinsic to the universe, and is not imposed on it from outside”. Really? And pray by what Magic did the “dynamical laws of the Universe” come to exist or to apply? Hawking may be an atheist but he invokes Magic whenever he refers to the singularity of the Big Bang theory (even if he claims not to). There are others (Alex Filippenko) who claim that quantum theory is the cause of the Big Bang and that the laws of physics are sufficient to bring about the singularity. But Filippenko is a little more honest than Hawking and admits that the “laws of physics” are in themselves Magical. What we don’t know lies in the Space of Ignorance. One Magic (and there are surely as many Magics as humans have ignorances) is that which transcends perceived “time” and applies even across singularities such as the Big Bang. But this, let’s call it, “Creation Magic” – like all Magics – lies in the Space of Ignorance. And if some people wish to do so, they can give this Magic (which we are ignorant of) the label of “God” or of “Nirvana”. This entry was posted on December 16, 2015 at 9:17 am and is filed under Astronomy, Physics. You can follow any responses to this entry through the RSS 2.0 feed. Both comments and pings are currently closed.